The Scottish Business Resilience Centre shot to fame over the weekend, scoring a clean sweep of headlines across a whole host of publications as they endeavoured to combat cyber crime. 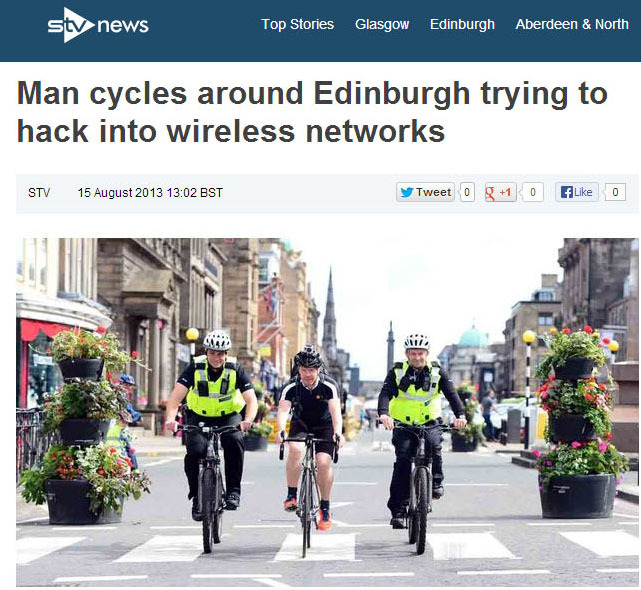 After discovering that a shocking 20% of all Edinburgh based homes and businesses are leaving themselves vulnerable from attack by cyber crooks due to insecure internet connections , the SBRC went on a ‘warbiking mission’ around Edinburgh to raise awareness of the problem. The initiative saw security experts get on their bikes and cruise across the city in an exercise to name and shame the most unprotected wifi spots in Edinburgh. The story was a hit, attaining widespread coverage across local and national publications, both in print and online as well as achieving a much sought-after primetime slot on the STV 6 o’clock news. Local coverage included articles in the Edinburgh Evening News, whilst the campaign pedalled its way to prestigious national coverage in the Herald, the Metro, the Sun, the Daily Mail and the Press and Journal as well as appearing online on the BBC, STV, Deadline News and the Scotsman websites. The coverage was achieved as part of an ongoing PR campaign by Holyrood PR – the full story can be found in the original press release.